When released to a salivating public last year, both the Jaguar XK Coupe and Convertible immediately garnered accolades from the fussiest critics. BBC’s Top Gear awarded it “Best Car of 2006”, Which Car voted it “Most Exciting Car of 2007”, MotorWeek dubbed it “Best Dream Car” and. surprisingly, Germany’s Auto Zeitung readers rated Jaguar “First in Quality”. The XK was designed and engineered above and beyond the high expectations customers rightly have for a Jaguar sports car, a fact made possible because everything from its advanced aluminium chassis to its sophisticated transmission and exquisite interior has been designed in pursuit of a luxurious, advanced and stunning new Jaguar. 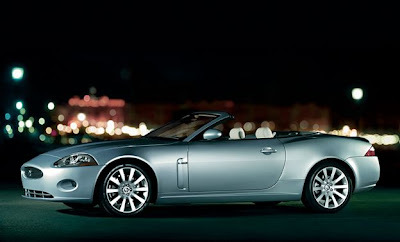 "The XK is exactly the sort of sports car that only Jaguar could produce - beautiful to look at and incredible to drive. The XK represents pure automotive desire on four wheels. Everyone who sees it wants to drive it and be seen in it," said Bibiana Boerio, Managing Director, Jaguar Cars at the 2006 launch. "It appeals to customers who do not make compromises in life because like them we have made no compromises in designing it. Whether you go for the drive of a lifetime through the Alps or cruise top-down across America, you will discover these are breathtakingly modern cars that share the heart and soul of every great Jaguar of the past. For the first time in a Jaguar, drivers use steering wheel-mounted paddles to change gear with the new Sequential Shift transmission. In either Drive or Sport Manual modes, very fast gear shifts - as quick as 600 milliseconds - are achieved by combining the use of one-touch paddles with an automatic blip of the throttle from the drive-by-wire engine management system during downshifts. The interior is very clean and driver-focussed, with simple architectural forms and minimalist detailing. What's in front of the driver essentially defines the feel of the car, which is sporty and functional. The dashboard lines flow from the A pillars to the centre console, whose advanced touch-screen carries the controls for many of the car's features - allowing the number of switches on the instrument panel to be kept to a minimum. A supercharged version (XKR) is due in May this year.